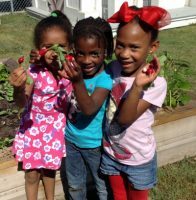 For over 25 years, Vogel Alcove has been providing child development services to children experiencing homelessness in the Dallas Metroplex, but in 2014 when the center moved from its small quarters on Akard Street to an expansive building and lot in the Cedars, it moved with a commitment to provide a state of the art outdoor education center for its children. Through generous donations by Jeff Chapman, Sheila Chapman Memorials, the Harold Simmons Foundation and Erin and Mike McKool, Vogel Alcove worked with a playground designer to create a natural play area named, “The Backyard”. Now, through regular interaction and play in this natural setting, our children receive the opportunity to reap the social, emotional, physical, health, and cognitive benefits that come from connecting to the outdoors and nature. In The Backyard, children often gather at the over-sized sand area that is encircled by natural cedar logs and accented by a long-standing sycamore tree that shades their play in the morning. From there, they push their dump trucks and tractors along a circular multi-textured pathway and across arched bridges. They stop along the way to fill shells with water at the tiered Water Works. They feed their dolls sand cakes and mulch beverages at the Pretend and Play area and join their teacher in a drumming rhythm at the Music and Movement area. They add pine cones to the top of a block tower at Construction Crossing and park their trucks before climbing and rolling down Toddler Hill. Infants gather in The Gazebo and the Infant Outpost to sing songs, observe the trees and clouds, play in herb filled sensory bins, and explore. In addition to daily interactions with their Therapeutic Early Childhood Educators, children enjoy special opportunities when corporate volunteers visit us from companies such as Southwest Airlines, Texas Instruments, Colliers, Capstone and others. Volunteers facilitate activities in each of the areas, creating flower-laced finger paintings and plant-based weaving in Artists’ Alcove, running through sprinklers in the Active Arena and engaging in the various therapeutic garden areas throughout The Backyard. 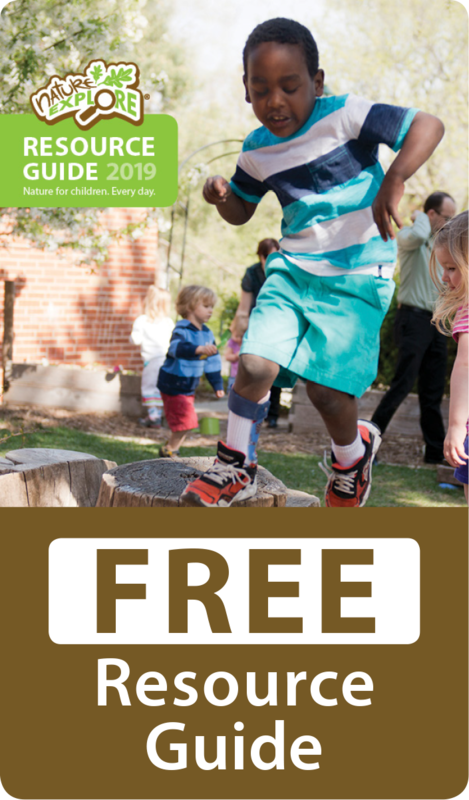 The Share and Care Vegetable Garden features six raised beds built by Th+A Architecture of Dallas, that the children tend with fresh seasonal produce. Interaction focuses on taking turns, providing personal space, developing empathy and caregiving skills, and in turn caring for oneself with healthy nutritious food. 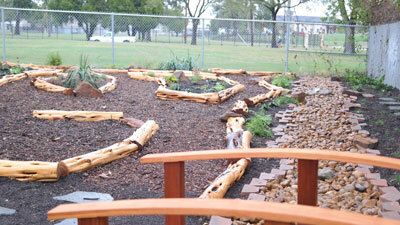 The Look and listen Sensory Garden, built by Pepsi-Co, features plants that stimulate and integrate the five senses. Interaction focuses on increasing attention spans, noticing details, gentle touches and deep breathing for stress reduction. The Bloom and Grow Wildlife Garden provides a space to observe and learn from the cycles of nature as seen in the native and naturalized plants that attract butterflies and insects. Stories, journaling, and exploration focus on resiliency and envisioning a beautiful future. Community support is integral to our program and we are truly grateful to all of the individuals and organizations that support us to sustain these opportunities.